Hello! I’m Hanna Holmgren and I work in Fatshark’s marketing team as a graphic designer. I have been composing screenshots for our marketing material - amongst other things - for a little over a year now and today I wanted to share with you some of the knowledge I’ve picked up along the way. I want to preface this post by saying that there isn’t really any right or wrong way to create screenshots. If you come up with other tools to use or a different approach to what you want to make, that’s great! I often have very different starting points and processes with each screenshot I make. Don’t see this post as a guide, but rather as some tips and suggestions to how you can approach the making of screenshots. I highly recommend using the player-made photo mode mod by SkacikPL. With it, you can freeze time, play animations on player characters, spawning custom lights, and much more. 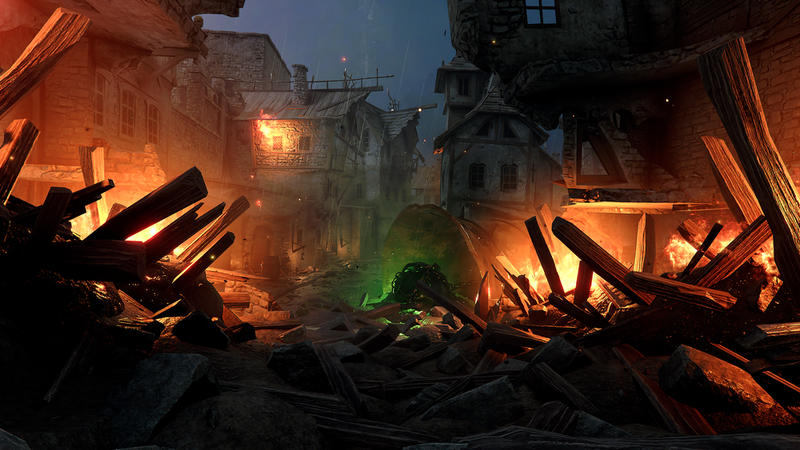 It will really make your life much easier as you take screenshots in Vermintide 2. Every screenshot I make starts with an idea. It could be from a cool scenario that played out in-game, that I might want to compose into a proper image. It could be from watching a movie. Or it could be from simply browsing other people’s screenshots and seeing how they set up their images. The most common source of inspiration for me is when I explore the world in the game and find unique spots in the maps that look cool. 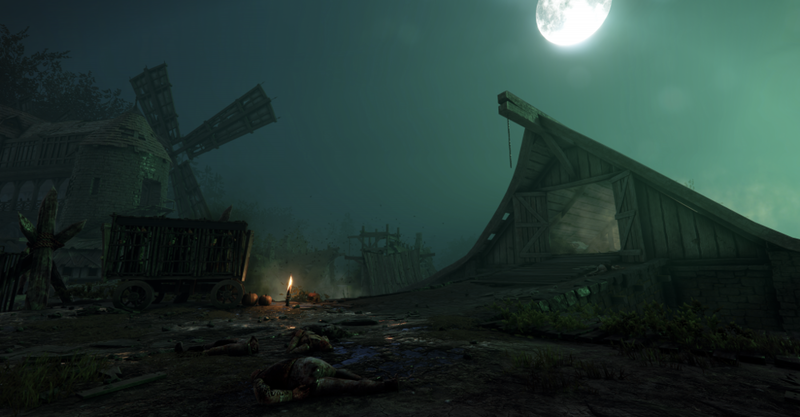 For example, with the preparation of our seasonal event Geheimnisnacht, I knew I wanted to find a place where you could clearly see Morrslieb, the Chaos Moon. During Geheimnisnacht, both twin moons are full in the sky. I found a spot in Against the Grain that I hadn’t really used before, it had an open sky and I liked the look of the path leading up to the open barn. I have the privilege of being able to work in Fatshark’s in-house game engine to set up our images. This gives me a lot of freedom in placing units and other props in the scene to make it come as close to my idea as possible. I won’t be focusing on this step in this post, but I wanted to show you how it might look. For this particular image, I just came up with things as I went along. As you might notice from this image and the end result, I moved some props around to make the image fit the composition I wanted. I haven’t used the Stormfiend in a lot of images, so I decided to use one as the image’s focal point. 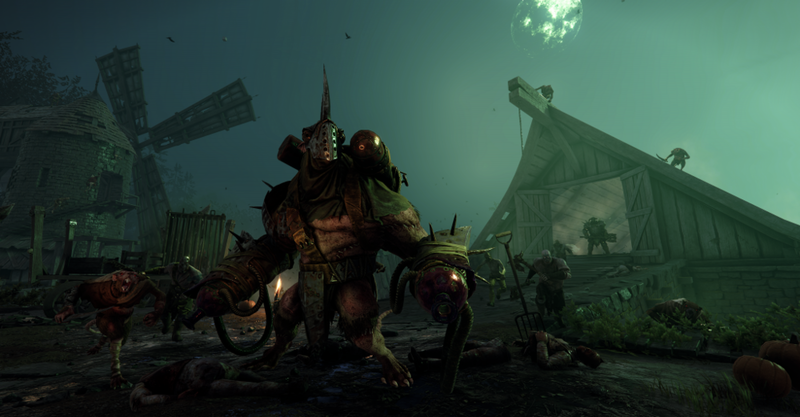 Vermintide is known, amongst other things, for its hordes of swarming enemies. I try to keep this in mind when I set up images, to make sure they stay true to the nature of the game. I also place some lights in the scene. I will admit that the extent of my knowledge of lighting a scene in-game is limited, but the tips and tricks I’ve learned from our talented level artists help. My intention is usually to just make sure there are no immensely dark spots and that it is easy to digest the image without having to squint your eyes. I use Adobe Photoshop CC for essentially everything that I do during the post-process. This is the final phase where I try to enhance the visuals as much as I can without making it look too rendered. I made changes to how the moons are laid out simply for the sake of the image’s composition. Below I’ll list some techniques I used for this image. This is a method often used in the digital editing of photography. When you dodge and burn, you manipulate the exposure in the selected area you’ve masked. To put it simply - you highlight brighter parts of the image (dodge) and make darker areas darker(burn). This all sounds a lot more advanced than it really is, at least at the level that I use it. I personally like the effect this gives the image and as such, this is a technique that I use frequently. I try to avoid using textures too frequently, and the reason for that is because I don’t want to stray too far from how the game truly looks in-game. When it comes to more promotional images such as this one, though, I tend to use at least a few simply because they can make the images look that much better. For example, I used a texture in this image to give the sky more depth. At the end of the day, there isn’t some step-by-step way to create the perfect screenshot. Create drafts, ask for feedback, search for inspiration online and get familiar with the tools you use. And most of all, don’t forget to have fun whilst making them! - Always have a main focus and purpose in the picture. What story does it tell? What do you want the viewer to focus on? - Using a drawing tablet makes things far easier when you want to mask certain things by hand or make strokes that are harder to make with a mouse. - Show your WIP(work in progress) to others for feedback. It is easy to gain tunnel vision when working on something on your own and the outcome tends to be a worse product. I try to make a habit out of showing my drafts to my colleagues (shoutout to the art department!). - Regularly browse images and artwork made by others. Good resources are Artstation and Behance. - When a character is angled or facing one specific direction, always make them face the center of the image. Usually, it feels unnatural to see them face away from the image. - I tend to work using as big source material as I can, even if the end result is a standard 1920x1080. This is simply to ensure that the resolution always looks crisp. - If you use SkacikPL’s photo mode mod, it’s a good idea to use the animation events. Each unit in the example above is posed with a static animation event since an idling unit will give the characters a slight blur when rendered. - To add that extra crispness to the image, consider adding a sharpen layer on top of the image before you begin the post process. You can do this by going into Filter > Sharpen > Smart Sharpen… You usually don’t need to adjust the Smart Sharpen settings a whole lot, just make sure you don’t sharpen too much! - You can create some really cool effects by playing around with the layer blend modes and layer opacity. I often just scroll through them until I find something that looks neat.